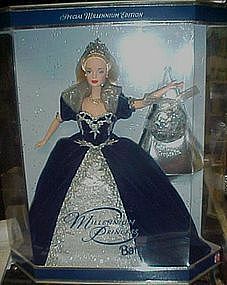 Vintage new in the box Special edition Happy Holiday Barbie 10th anniversary from 1997. Great Christmas item. 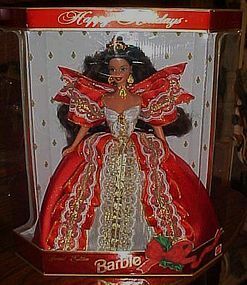 Happy Holidays 1998 Barbie Doll Special Edition Mattel New in box but box has wear from being kept in storage for years. A beautiful Christmas edition. 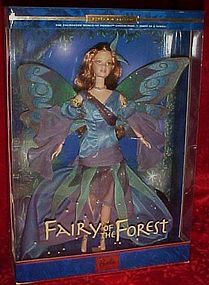 Beautiful Barbie, fairy of the Forest doll comes in her original box and has never been removed. She is first in the Enchanted World of Fairies series. Box is also excellent. A wonderful addition to your Barbie collection. 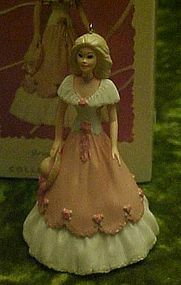 Flowers trim Barbie’s pink scalloped overdress in this 1997 Hallmark spring or Easter Keepsake ornament.Artist: Patricia Andrews Original price tag 12.95. Mint condition and comes in the original box. 1998 Sweet Treats Barbie can really hold the mixer! 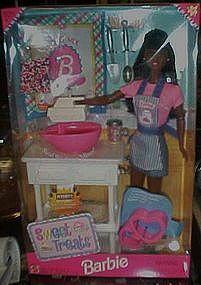 African American, Barbie is wearing an apron and comes complete with a little kitchen counter mixer, bowl, utensils and everything your little girl needs to decorate cookies and cakes with her .Comes mint in the box. Box is also excellent. Beautiful Barbie looks dazzling as she celebrates the new millennium in grand style! She holds a beautiful keepsake crystal ball of the year 2000... a remembrance of this historic moment in time! "Comes in the original box and has never been removed. Box is excellent also. Made by Mattel. Looking better than ever, Barbie proudly holds 40 beautiful "roses", 1 for each year of her extraordinary success in inspiring generations of women to reach for the stars and pursue their best dreams. She's wearing a stunning black and silvery gown inspired by the original 1959 bathing suit she wore in the very beginning. A miniature replica of the original 1959 doll and package are included. Like Brand new, and never out of the box. Photo reflects lots of glare, sorry. 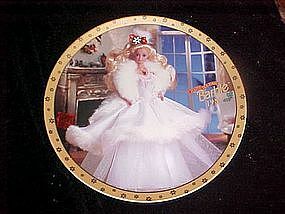 Limited edition collector plate liscenced by Mattel and issued by Enesco for the Happy Holidays Barbie series. 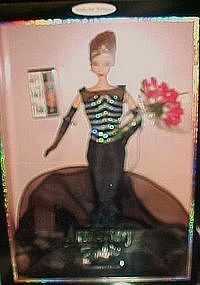 This plate portrays the 1996 holiday Barbie which is wearing the burgundy velvet gown with gold lam`e. Plate measures 8 1/4" and was limited to one year of production and is hand numbered. Comes in the original box with certificate of authenticity. Pristine condition. 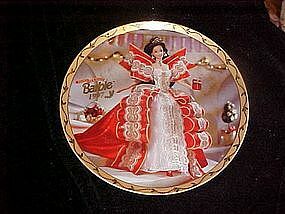 Limited edition porcelain collectors plate liscenced by Mattel and issued by Enesco for the Happy Holidays Barbie series.This plate portrays the 1997 brunette Holiday Barbie in her beautiful red satin gown complimented by lots of white lace. This plate was limited to 1 year and is hand numbered. It has a low number of 363. Measures 8 1/4" in diameter and is in perfect condition. Comes in the original box with certificate of authenticity. 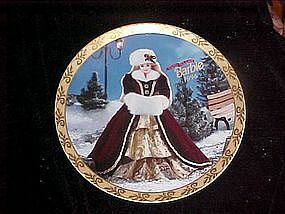 Limited edition porcelain plate (1 year) liscenced by Mattel and issued by Enesco in 1996 for the Happy holidays Barbie series. 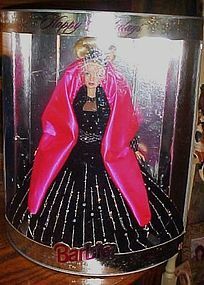 Portrayed is the 1989 Holiday Barbie in her glittering white gown with faux fur and tulle. Measures 8 1/4" in diameter and is hand numbered with nice gold border. Perfect, pristine condition and comes in the original box with certificate of authenticity.